Musicians from the Arkansas Symphony Orchestra will be performing this evening (January 13) in the lobby of the historic Capital Hotel. The music will start at 5:15 pm. The concert will feature the Rockefeller Quartet. Members of the quartet will introduce the pieces to be performed. The Rockefeller Quartet will perform an eclectic program featuring tangos, Scott Joplin Rags, selections from Beethoven and Borodin, and even a popular surprise. Unlike concerts in music halls, guests here are encouraged to bring drinks to their seats or to stand and move around while the musicians are playing. It is a relaxed, informal atmosphere where the audience and musicians alike are able to interact with each other. 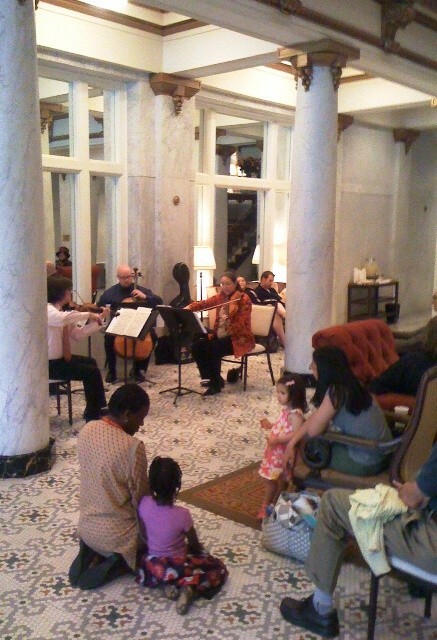 In 2011, the ASO started these free concerts in the lobby of the Capital Hotel. The marble and tile of this historic lobby provide a wonderful acoustic backdrop for the musicians. Today (November 24) at 4:30pm, musicians from the Arkansas Symphony Orchestra will present a concert at UAMS as part of the Ruth Marie Allen Concert Series. This FREE concert will take place in the lobby of the UAMS Hospital. 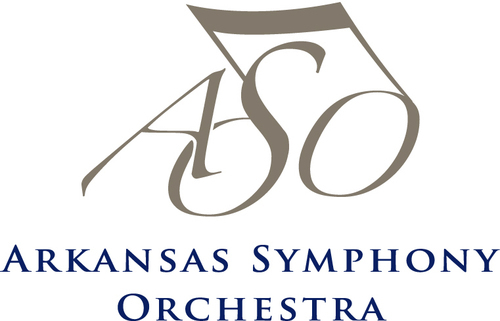 The Arkansas Symphony Orchestra, Philip Mann, Music Director and Conductor, presents the opening concert of the 2015-2016 River Rhapsodies Chamber Music Series: Artist of Distinction: Jon Kimura Parker on September 29, 2015 at 7:00 PM. ASO musicians including the Rockefeller Quartet are joined by the 2015-2016 Richard Sheppard Arnold Artist of Distinction, pianist Jon Kimura Parker, for music from Borodin, Hirtz, and Beethoven in the beautiful Great Hall of the Clinton Presidential Center. A cash bar is open at 6 PM and at intermission, and patrons are invited to carry drinks into the hall. Media sponsor for the River Rhapsodies Chamber Music Series is KUAR/KLRE. My friend and colleague, the composer William Hirtz, can work pianistic miracles out of harmony, rhythm and texture. Several years ago he showed me a piano duet Fantasy that he had composed using several of Harold Arlen’s iconic themes from the “Wizard of Oz” soundtrack. It was joyous, technically raucous, and seemingly featured dozens of notes all at once. I jokingly commented that I if he could arrange this Fantasy for one piano two hands, I would happily play it. I thought nothing more about it. Here is the Wizard of Oz music in all its glory. It’s one of the most difficult works I’ve played, period. If you’re a pianist and would like to order a copy of either the two handed or (more reasonably playable) four handed version, feel free to contact William Hirtz directly at w.hirtz@att.net. The Arkansas Symphony Orchestra, Philip Mann, Music Director and Conductor, presents the first concert of the Stella Boyle Smith Masterworks Series: Grieg’s Piano Concerto, 7:30 PM Saturday, September 26 and 3:00 PM Sunday, September 27, 2015. 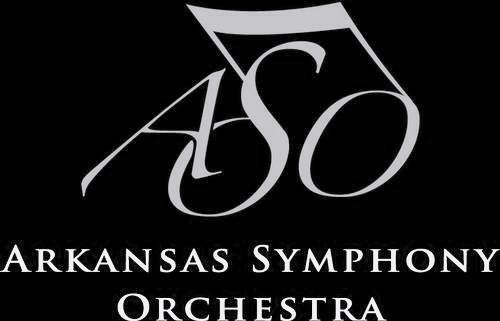 Featuring Jon Kimura Parker on piano, the Arkansas Symphony Orchestra will take the stage with Mendelssohn’s concert overture, Fingal’s Cave, Grieg’s Piano Concerto in A minor and Borodin’s Symphony No. 2 in B minor. The Masterworks Series is sponsored by the Stella Boyle Smith Trust. The concert is sponsored by Metal Recycling Corporation. Shuttle service is available – The ASO provides shuttle service from Second Presbyterian Church in Pleasant Valley to the Maumelle Performing Arts Center and back after the concert. 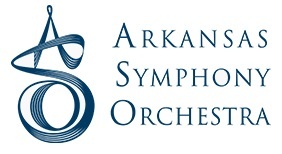 For more information and to purchase fare, please visit www.ArkansasSymphony.org/shuttle. Grieg’s legendary Concerto boasts one of the most familiar openings in the entire concerto repertoire, owing much to its simplicity. Grieg composed the work while sharing a house with pianist Edmund Neupert, who advised him on the solo part and to whom the piece was eventually dedicated in gratitude. Fingal’s Cave evokes the majesty and mystery of the sea. Mendelssohn composed the work after touring the Hebrides, including the flooded grotto known as Fingal’s Cave. The piece influenced later compositions on similar subjects, such as Wagner’s opera, The Flying Dutchman, and Debussy’s symphonic work, La Mer. Later this month, the Arkansas Symphony Orchestra’s Landers FIAT River Rhapsodies Series will start. All concerts in this series take place at the Clinton Presidential Center Great Hall and start at 7pm. Under the baton of Maestro Philip Mann, the 2015-2016 Arkansas Symphony Orchestra S tella Boyle Smith Masterworks series features a lineup with something old, something new, something borrowed and jeans that are blue. The borrowed is the location. For the second of two seasons, the Maumelle Performing Arts Center will be the Masterworks home. The new includes a World Premiere of D.J. Sparr’s Concerto for Jazz Guitar, which will feature Ted Ludwig. Another new selection is Scott McAllister’s Black Dog which is based in hard rock. Among the old friends returning are pieces by Grieg, Dvorák, Haydn, Mendelssohn, Borodin, Beethoven, Tchaikovsky, Rossini, Stravinsky, Brahms, Shostakovich and Bernstein. The season kicks off with Grieg’s Piano Concerto on September 26 & 27. 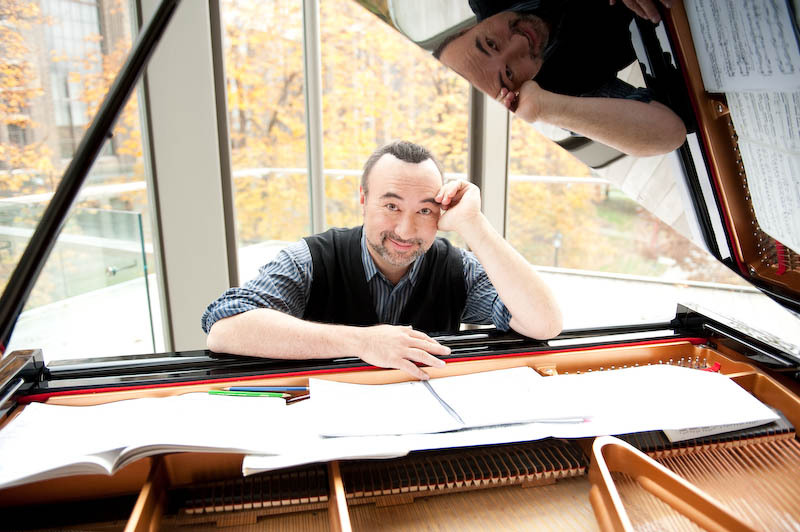 The guest artist that weekend is pianist Jon Kimura Parker. The concert will include Mendelssohn’s The Hebrides, Op. 26 “Fingal’s Cave,” Grieg’s Piano Concerto in A minor, Op. 16 and Borodin’s Symphony No. 2 in B minor. Next is Dvorák’s Symphony No. 8 on October 17 & 18. Imre Palló will be the guest conductor, and Cicely Parnas, cello will be the featured artist. The program will include Kodály’s Dances of Galanta; Haydn’s Concerto for Cello in C Major;and Dvorák’s Symphony No. 8 in G Major, Op. 88. The annual Beethoven and Blue Jeans concert will be November 7 & 8 featuring guest artist Kelly Johnson, clarinet. The lineup will feature Beethoven’s Symphony No. 8 in F Major, Op. 93; McAllister’s Black Dog; and Tchaikovsky’s Swan Lake Suite, Op. 20a. 2016 will start with Firebird Suite and featured soloist Kiril Laskarov. On January 30 & 31 the program will include Rossini’s La gazza ladra: Overture; Mendelssohn’s Concerto for Violin, Visconti’s Black Bend and Stravinsky’s The Firebird Suite (1919). February 27 & 28 the program is Bernstein and Brahams. The concert will have Bernstein’s Chicester Psalms and the Brahms Ein deutsches Requiem. The 2015-2016 season will wrap up on April 9 & 10 with Shostakovich’s Symphony No. 5. The concerts will include Bernstein’s Candide Overture; Sparr’s Concerto for Jazz Guitar and Shostakovich’s Symphony No. 5 in D minor, Op. 47. Next is Dvorák’s Symphony No. 8 on October 17 & 18. Imre Palló will be the guest conductor, and Cicely Parnas, cello will be the featured artist. The program will include Kodály’s Dances of Galanta; Haydn’s Concerto for Cello in C Major; and Dvorák’s Symphony No. 8 in G Major, Op. 88.